"I'm going to take this home to show it to my mom," L said with genuine excitement in her eyes. She was practically hugging the book. My plan to take this recently purchased book back home to my own children vanished. I discovered this book yesterday at the book fair at my children's preschool. It is that classic song, "Sing!" 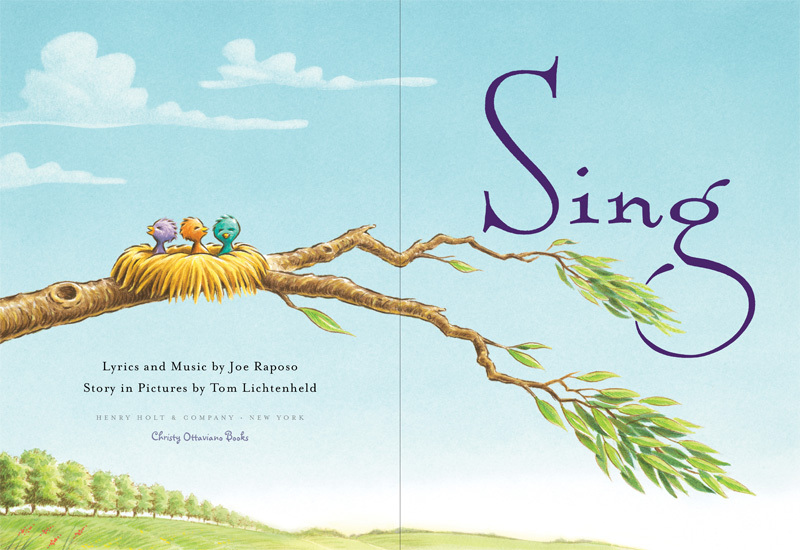 from Sesame Street, now beautifully illustrated by Tom Lichtenheld. The lyrics were written by Joe Raposo, when he was asked to create a bilingual song for Sesame Street. The book contains a note from the songwriter's son, talking about his father felt isolated and stigmatized growing up in the United States in the 1940's. The song was an anthem for self-acceptance and courage and has been translated into 35 languages and sung by many different famous singers through the years. I remembered it well from my own childhood and from my Sesame Street watching years with Alex. 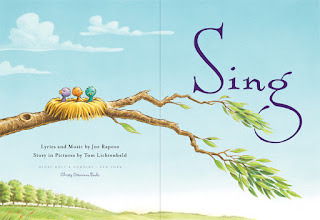 But back to L. When I shared the book with my third graders earlier this morning, I had the song ready to play as I showed the pictures. We spoke about how the song was also written in Spanish and the lyrics were printed in English and Spanish at the back of the book. She couldn't stop looking at the page of Spanish words, proudly telling me she knew all the words and reading it quickly, her voice sounding different as she recited the lyrics. The song only played in English and she asked me if I could play the Spanish version later. As we got ready for home, I searched Youtube and found Sesame Street in the 70's with Luis playing the guitar and singing "Canta". I noticed several students mouthing the words in Spanish as it played. I had to admit, finding ways to weave in other students' cultures sometimes feels like an impossible and unrealistic expectation in the "highly effective" slot in the Danielson rubric. When I already need to cover all subject areas, differentiate for diverse abilities, purposefully integrate technology, communicate with parents, how can I add multicultural influences into my lessons too? Today, I got it. Why it's so important to find ways to weave in students' cultural backgrounds into the classroom. Seeing L. absolutely delight in reading and listening to a song in Spanish, knowing she had to hold that book and bring it home to show her parents, I finally, really, understood. June 25th is the last day of school. Final grades, report cards, literacy profiles, organizing, and packing up the room are some of the essential "to-do's." As I embark on starting and completing these tasks, I don't want to lose sight of bringing a sense of joyful closure to my community of third graders. I want them to feel good about our year and our work together and I want to leave them with the lasting idea that they are all important and special. I also purchased a book for each student as a gift. Deb Pilutti, author of Ten Rules of Being a Superhero, was kind enough to donate awesome Superhero bookmarks, which I will wrap with each book. I've been reading a lot this summer. Books for "fun" and books for professional learning, which I also find fun! I read Being the Change by Sara K. Ahmed as part of #cyberPD and I'll Give You the Sun by Jandy Nelson as part of a teacher book club. You can see the other books I've read by clicking on my Buncee shelf. Many of the books I read circled back between the themes of identity and then community. Knowing yourself, appreciating who you are and then honoring other people's identities within a community. For this year's #PB10for10, I decided to select 10 books that will help me build a strong classroom community. The books I selected tap into students' identities and beliefs about themselves. They also will help begin conversations about respect and what it means to be part of a community of learners. Without further ado, here are the ten books I will read to foster identity and community in the beginning of the school year. #SOL16 Day 19 Is PD a 4 Letter Word? #SOL16 Day 8 Clean Up Captain Saves the Day! #SOL16 Day 7 What Does the VOX say?